We are introducing the headliner of the biggest event of DupleX, The Rooftop Venue in 2019. 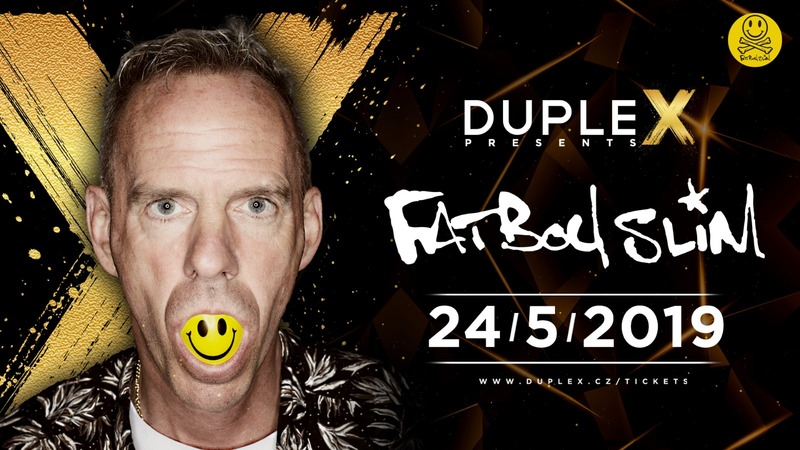 Legendary DJ and producer Fatboy Slim will arrive to DupleX, Prague on 24th May, 2019. It will be the first time in history when the most phenomenal representative of the world dance scene will perform in a Czech club. Fatboy Slim, born Quentin Leo Cook, also known as Norman Cook in clearly „the“ legend of world electronic music. Together with artists such as The Prodigy or The Chemical Brothers he is one of the pioneers of the genre called Big Beat. His style is also known as a combination of hip hop, breakbeat, rock and rythm and blues. As a kid he dropped out his native name „Quentin“ and began to call himself as „Norman“. Under the pseudonym Norman Cook still performing today. Fatboy Slim has celebrated his biggest success with the second album You’ve Come a Long Way, Baby (1998). „Right Here, Right Now“ and „The Rockafeller Skank“ singles have become immortal. His legendary set in hometown Brighton attracted about 250 000 visitors – this concert is recorded at his album Live on Brighton Beach (2002). Videoclip of „Praise You“ won three and „Weapon of Choice“ even four prizes at the MTV Music Video Awards. In May 2007 he received the Ivor Novello Award for his lifetime contribution to music.